Learn how tapestries were made in the time of Louis XIV and are still made today. Explore the process of tapestry weaving at the Gobelins Manufactory in Paris, where historical techniques dating to the time of Louis XIV are used to make contemporary works of art. How to weave art yarn into fiber art. This video is the 3rd part of a 4 part series on art weaving using handspun yarn and hand dyed yarn. This is part of my get started art weaving series. 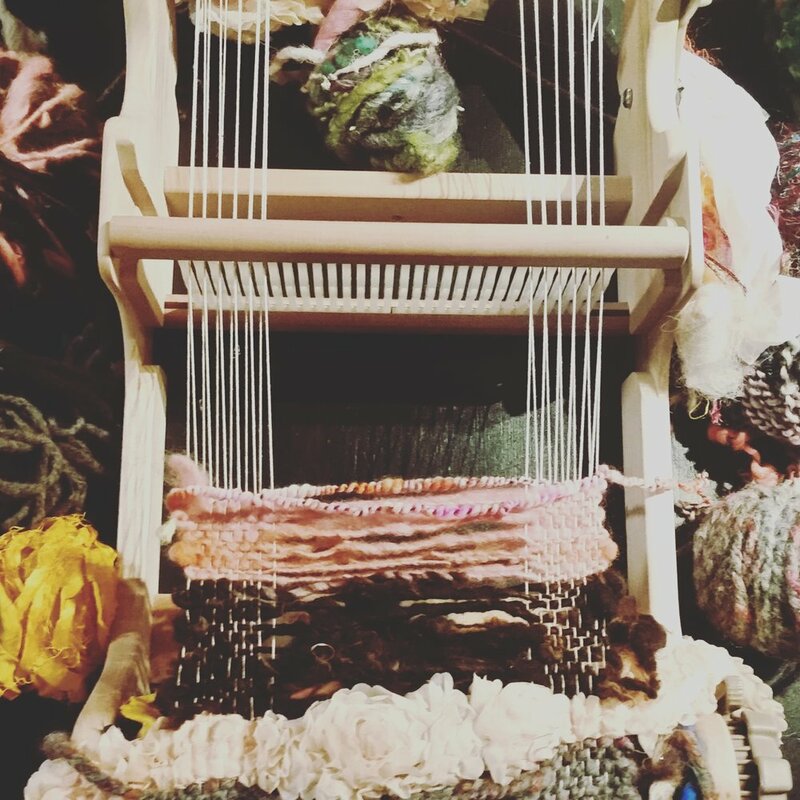 sign up for this free course here: http://urbangypz.com/start-weaving-art/ Check out my Art Weaving Beyond the Basics ecourse! 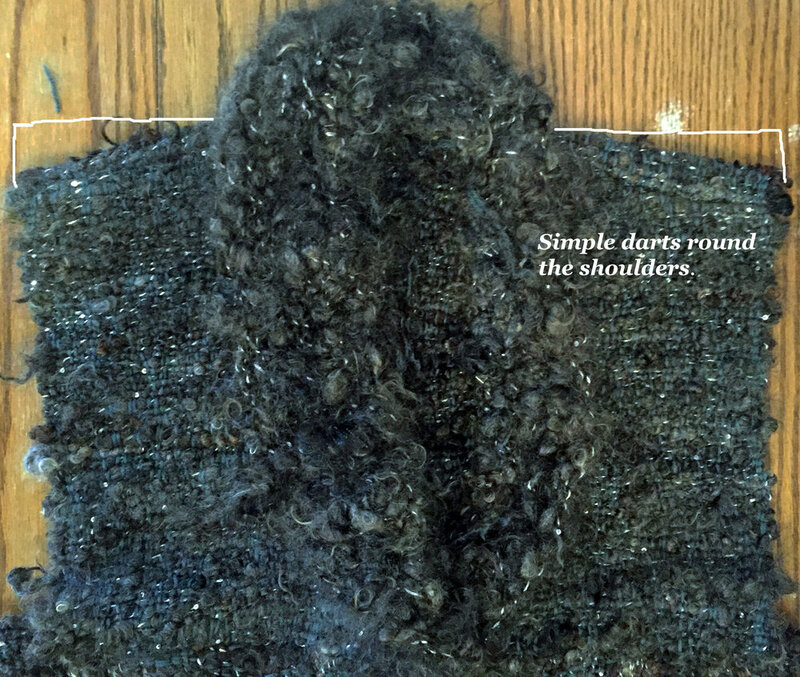 This idea was centered around a yarn that Laura Spinner had spun from Wensleydale Locks from Melissa Kness. You can read more about Melissa's farm here and shop for this yarn in Laura's ETSY shop - or spin your own from a kit from Melissa's ETSY shop. I let Melissa choose the colors of this yarn and told her all I wanted was some fun tailspun to use as an accept warp in a scarf. I ended up using this yarn in almost every scarf in my Spring 2017 series for THISyarn because it was so joyful and I loved working with it. My idea for this scarf was to weave this yarn with pure white yarn - but when I sat down to weave I didn't have enough white yarn. So I used a blend of white & grey & navy blue with some copper (all psudo-neutrals to my eyes) and started weaving. The end result is a more muted idea of my original inspiration - but just as beautiful. In order to accomplish this look I used my Ashford Sampleit Rigid Heddle loom with a 2.5 dent reed. I used 4 strands of the accent yarn (slightly off-centere) and grey handspun warp yarns in a similar weight thru the rest of the reed. Then I wove the navy / white handspun yarn from my stash until I was at the end of the warp. 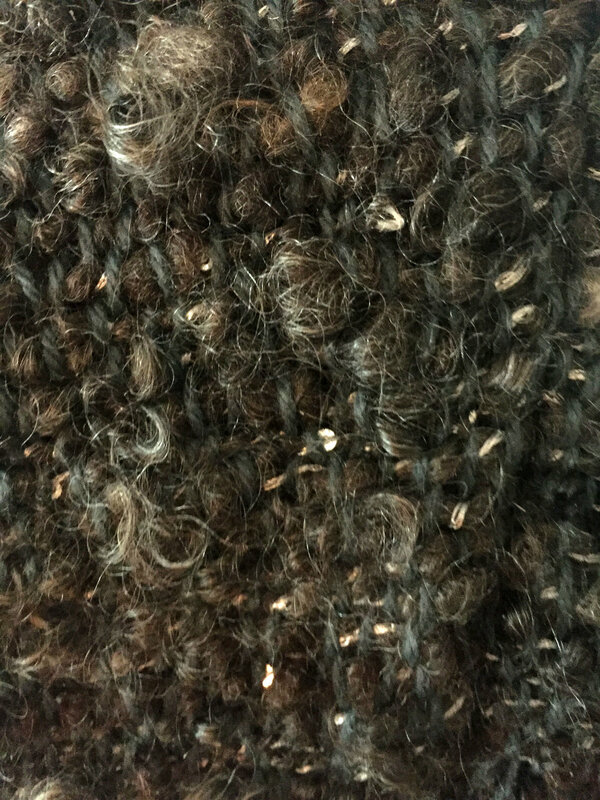 The last step was to go thru the scarf and fine-tune the locks by gently pulling them out of the weft and letting them hang free. I think this scarf came out simply lovely - and it's a great use of one special accent yarn in your stash over an entire project. Accent stripes would be lovely on woven blankets, cowls, pillows, and hats. One of my weaving experiments was taking sari silk ribbon as my warp on my Ashford Sampleit Loom (using a 2.5 dent reed) with art yarn and seeing what the benefits & downsides were for using fabric as a warp. My favorite moment of this scarf was when I took it off the loom and didn't like one of the wider ribbons I had woven as weft. I removed the ribbon, which left a gaping hole showing off the warp and I really liked this. Looking back - I think I would have spaced out this scarf with many open-warp areas to show off the warp. Maybe weave an inch of worsted weight yarn. Then weave in bulky fabric (to be removed to expose the warp) for a section - then weave worsted again. The silk ribbon gave the scarf plenty of drape. It didn't feel stiff or tight. The fringe on the ends was spectacular - full and thick. You could play with this idea by using fabric as a stripe down your warp - or just on the edges. Or just do fabric down the middle. Experiment. Try something new. You never know what you might discover when you step outside of the books. I had some unusual yarns that I wasn't sure what to do with. Really short length of lock spun, a dozen or so yards of long twist fringe yarn, a really fat somewhat soft spun wrapped yarn... they needed the right project. When I bought a 2.5 dent heddle for my loom, suddenly some possibilities opened up! I decided to use them as warp. Now, I did regret using the fringe yarn as warp while I was weaving because I had to keep all the fringes from getting packed in with the weft for every pass up until the fringe was at the edge of the weaving progress and ready to hang down. Multiply by all the twists, and it was a lot to pay attention to. But when it was done, I was glad I persevered! I still might leave those yarns as weft choices in the future, though. Ha. The other yarns looked and worked nicely as warp and I'm glad I used them. For weft, I used a mix of yarns, but didn't pack them too tight most of the time so the warp yarns could shine. I did use a little of commercial yarn because matching color mattered more to me than being exclusively handspun. Fun details besides the twists include cutting the warp ends long and uneven so it makes a cool fringe, and weaving in a little crocheted flower (though I did tie it in because my ends were a bit short to hold it in place when just woven in). I love the creative possibilities in weaving, and I think it's a perfect medium to highlight the good qualities of both "normal" and unusual handspun yarns! I will be able to continue to play with dent, warp, and weft choice for many years to come without getting bored. About this class: Learn the basics of making one-of-a-kind woven tapestries with Annabel Wrigley. Annabel begins by showing you how to build your own loom using an inexpensive frame and nails. Did you like this video? About this class: Learn the basics of making one-of-a-kind woven tapestries with Annabel Wrigley. In this installment, Annabel shows you how to set up the warp threads on your loom. Did you like this video? About this class: Learn the basics of making one-of-a-kind woven tapestries with Annabel Wrigley. Now that your loom is warped, you're ready to learn how to weave. Annabel will also show you how to add decorative fringe to your tapestry. Did you like this video? About this class: Learn the basics of making one-of-a-kind woven tapestries with Annabel Wrigley. In this segment you will learn how to change colors, adding stripes and color-blocked shapes to your woven design. Did you like this video? Hooray, you've finished the first half of Annabel's Weaving class! In her next class on Creativebug, Annabel teaches more complex weaving techniques: http://bit.ly/WeavingPart2 SUBSCRIBE: http://bit.ly/1QLfp1r About this class: Learn the basics of making one-of-a-kind woven tapestries with Annabel Wrigley. Annabel shares an easy way to create short fringe, and then shows you how to remove the weaving from the loom. Take an ordinary branch from outside, paint it, add yarn, beads, and pom-pons, and now you have a beautiful weaving that you can hang on your wall. My favorite weaving technique that I discovered thru experimentation was leaving a wide gap in my loom. I threaded about 1 inch of warp on either edge. The results were very beautiful to me and I loved the way it allowed the textures of art yarns to "breathe". I spent 4 weeks in December & January with my Ashford Sample-It Rigid Heddle Loom experimenting with a huge collection of yarns and scraps from my stash. I wanted to learn, hands on: what warp threads to use, what different yarns do, what intentional "mistakes" are beneficial, what "mistakes" shouldn't be repeated, and teach myself as much as I could (my favorite way to learn) about the most basic guidelines of weaving with art yarn. When I used slippery (metallic gold) warp thread, my weaving fell apart. The knots untied after a day and it unraveled. Lesson learned. No slippery threads for me. When I used a stretchy warp thread (not even realizing that it had stretch) I wove a scarf and when I took it off the loom it was 50% the size that I planned. Impossible to wear. Awkward length. Lesson learned. I might try a length of stretch in the future (like elastic warp thread down the center of a scarf to create a very ruffly scarf) but as the entire warp - nope. Now I triple-check all my threads to make sure they aren't stretchy. Thick warp (like fabric) makes a scarf that many people might find too heavy / bulky. But the fringe on the ends is sure pretty. Anything with a bulky warp needs to be woven super, super loosely or it becomes rigid and uncomfortable to wear. Cotton warp thread is my favorite. By far. It isn't too stretchy, or heavy, or itchy, or grabby. It's got the goldilocks principle: it is just right. Leaving intentional big gaps in my warp was my favorite technique to play with. It allows the art yarn to breathe and be exposed like it is in the skein. And, as someone who is inspired by skeined yarn rather than patterns, this was a big deal to me. Using an accent yarn as a stripe in the warp (slightly off center) created a very pretty result. Putting fringe on anything was winning. Using any type of weft art yarn went effortlessly. There was never a moment thru my stash of random yarn where I said, "This yarn isn't working". Every yarn worked. Every yarn looked great. Weaving seems to be the best answer for mystery or abstract project yarns. Leaving all the ends untucked = fringe = winning. Wirecore yarns used as the center warp yarn. To create a sculptural / moldable scarf. Elastic yarn used as the center warp yarn to create a ruffly scarf. 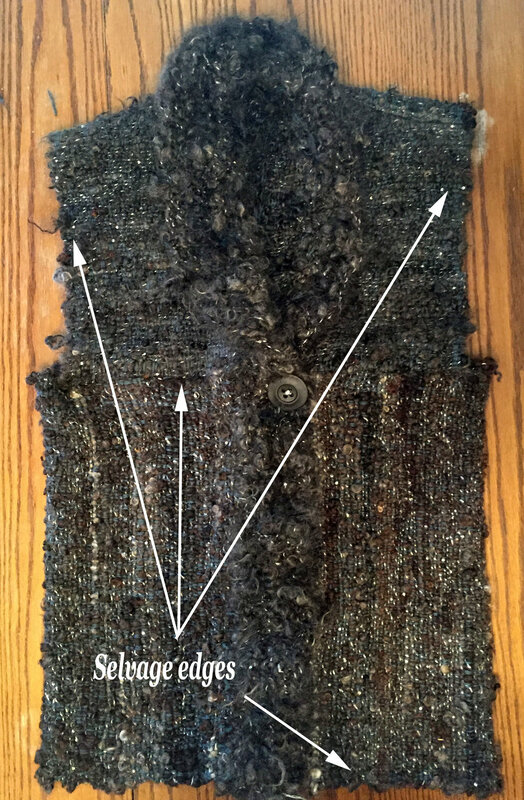 Weaving a whole scarf just as fringe texture. I hope these simple guidelines help you as you begin your own weaving journey. Happy Weaving!